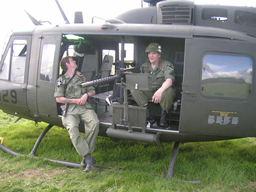 The middle of July saw the Huey in for general maintenance and one or two minor jobs that required attention after a busy few weeks at the Air Shows. Once the work had been completed Phil wanted to take the Huey out to make sure everything had been fettled. 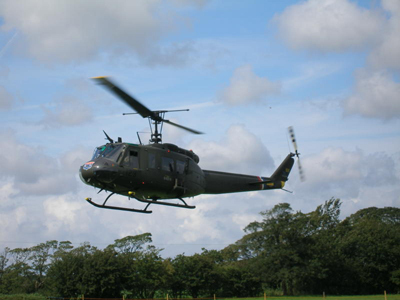 We had an event pencilled in for the weekend of 28 th /29 th July and had agreed to do a fly-by at another event on the way. The original event didn't materialise but the fly-by seemed an ideal opportunity to take the Huey for a test flight to check all was ok. Phones calls were made to the organisers of the 'Salute to the 40's' weekend that was being held at Rawcliffe Hall, just a few miles north of Wesham. 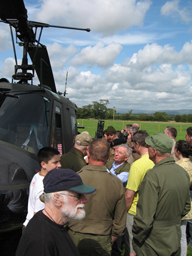 The organisers of the show and the owner of the caravan park readily agreed for us to land on site. 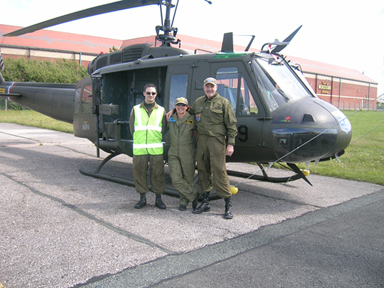 The show was held over two days and we decided that the Saturday would be the best day so we made the final calls to confirm our arrival and Phil, Simon, Bradley and Nina headed off to Blackpool Airport early Saturday morning to check over the Huey and to attach the now obligatory .50 cals. 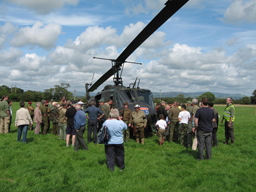 Bradley then headed north to act as the welcoming committee at Rawcliffe and to guide us in to the field and to make sure the assembled crowd were safely corralled. Phil and I made the final checks and put a call in to Blackpool Air Traffic to notify them of our planned departure and where we were flying to. Phil lit the fire and wound up the 509. 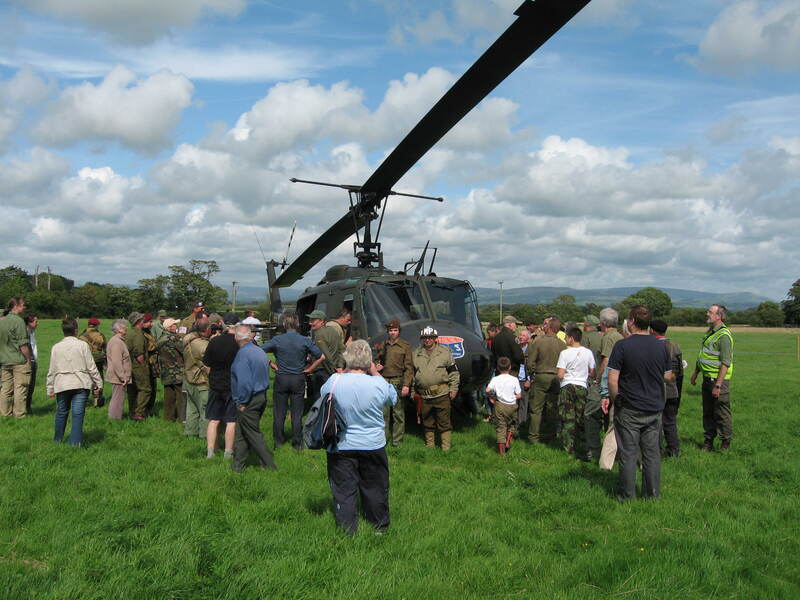 Rawcliffe is a matter of a few minutes flying time from Blackpool which meant those eagerly awaiting our arrival didn't have too long to wait before they heard the unique sound signature of the Huey. Although we had checked out the site on satellite photos and ordnance survey maps, Bradley also gave us an update as to what we had to look out for on our approach. We flew from the south and then flew around to the east of the site and did a full circuit anti clockwise to get a good view of where we were going to land. 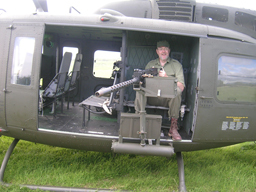 Once back to the east we then flew a low pass as we checked out the lie of the land and to check out the obstacles Bradley had warned us about. We did a hard right turn to return just to the north of the field to then turned back to the west for our approach in to wind to land. Watching Bradley on the ground Phil brought 509 in smoothly to the allotted space. Once down we wound everything down. With the rotors secured those who had been waiting patiently had their chance to get a closer look. Nina was whisked away by one of the organising team and they reappeared with some hot steaming tea and bacon butties - excellent!! The crew had their work cut out to answer all the questions which were as usual many and varied. Plenty of photos were taken, everywhere you looked there were cameras pointing at the machine and clicking away. 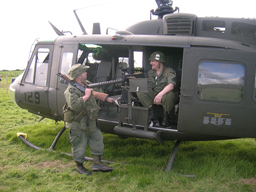 Although it was primarily a 40's event there were some Vietnam Re-enactors there, so they trooped across with all their gear on and posed for pictures, not just for themselves but for everyone as well. After about an hour it was time for us to depart. We lifted from Rawcliffe and left as always beating the air with the massive rotors to give those on the ground one last chance to hear what a Huey does best. 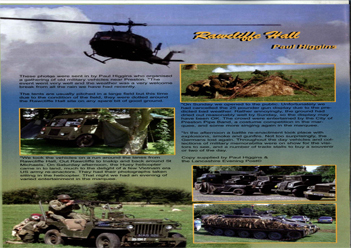 Our thanks to Dave Baggott of Rawcliffe Hall and Paul Higgin, of the South Cumbria/North Lancs Area of the Military Vehicle Trust, who were very accommodating to make arrangements at short notice for our arrival.